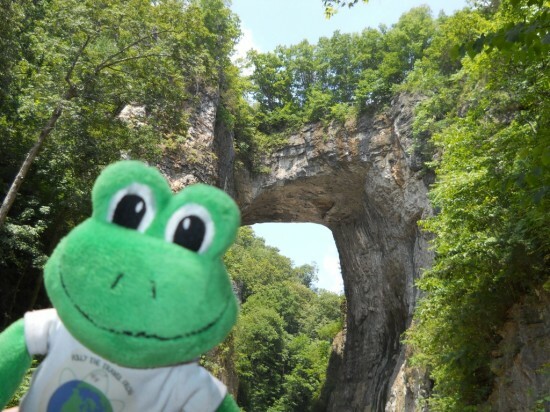 The Natural Bridge, situated in Virginia’s Shenandoah Valley, is located approximately two miles off of I-81 when you take exit 175. After a long road trip from Florida, we were happy to have the chance to take a break and stretch our legs. Accessible only through the Natural Bridge Gift Shop, we paid the entrance fee and started the downhill walk into the Cedar Creek Gorge. The trail was delightful and we were even serenaded by the sound of running water as we walked past the Cascade Creek & Falls. Our informational brochure called it a cascading waterfall, but on the day we were there it was nothing more than a slight trickle. Regardless, it looked and sounded great. 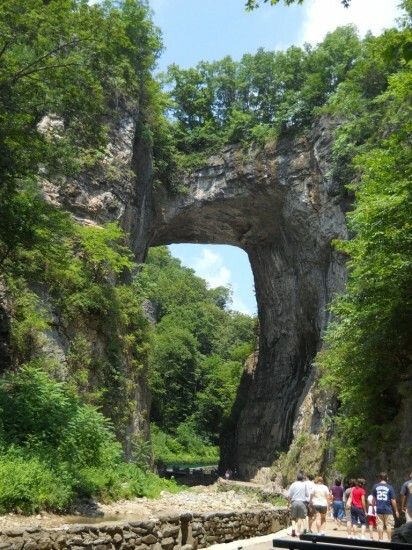 The Natural Bridge, a Virginia National Historic Landmark, has a rich and varied history. Created 500+ million years ago and discovered by the Monacan Indians, this giant stone structure was once owned by Thomas Jefferson. It is believed that George Washington carved his initials, G.W., into the rock face when he worked on a surveying team when he was a young man. 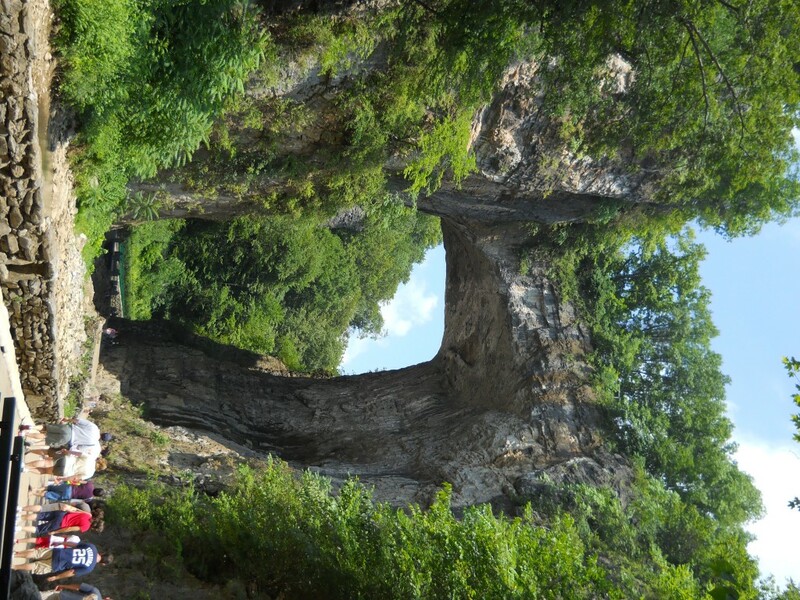 It's hard to tell from the picture, but the Natural Bridge is 215 feet high, 40 feet thick, and 100 feet wide with a 90 foot span between the walls. Polly felt like a little itty bitty frog! Can you see why some people called it, ‘The Thumbprint of God’? Wow that is gorgeous. I bet anyone walking underneath it feels tiny. Makes me wonder about the history of it and how others viewed it way back when. We stopped at the Natural Bridge to stretch our legs after a long ride up from Florida. We didn’t eat anything when we were there. Oh wait, I did slurp down a juicy dragonfly that was hanging out near the water. Yum! Thanks for writing! 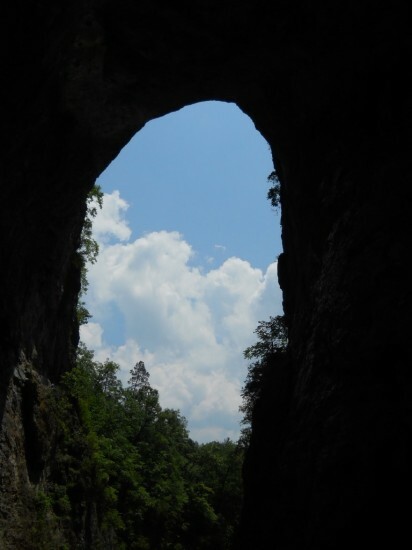 I was amazed by the size of the natural bridge, and you’re right, we felt very little next to it. Route 11 runs right over the the top of it and it was really strange to hear the slight buzz of traffic while marveling at a natural landmark. Woah! that is a huge bridge I would be so nervous to walk under it. But, it will probaly make me wonder. 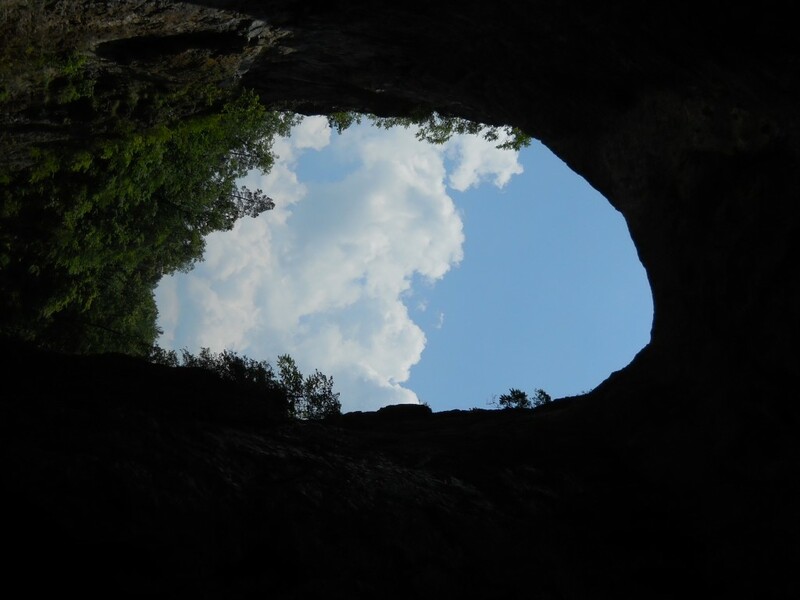 It’s an amazing natural structure! I was only slightly nervous when I walked under it. I didn’t want a rock to fall on my head!